By Beverly D. Flaxington, Special for US Daily Review. 1. To fill up (time or space). 2. To dwell or reside in. 3. To hold or fill (an office or position). 4. To seize possession of and maintain control over by or as if by conquest. 5. To engage or employ the attention or concentration of. While the protestors of the “Occupy” movement would likely say they are engaging in descriptor numbers 2, 4 and 5 of this definition, there is little here to indicate a desire to action – to actually shift and change what they are currently occupying. Why do people protest in or “occupy” an area? Most of the time they believe something is wrong or unfair, and they want to call it to the attention of either the perpetrators or others they believe may care or have influence to do something. The Occupy movement is on track, in that many things in our culture need to shift and be examined and addressed. Unfortunately, one of the problems we have is the attribution of blame to others and the unwillingness on the part of many people to assume responsibility and be a solution – not a problem. But our schools today, when they teach to the tests, do not teach problem-solving and thinking for one’s self; as a result, we’re becoming a culture that is fast to blame – and much slower to take responsibility and fix anything. My training and experience as a corporate consultant, college professor, public speaker and writer often urges me to create processes and education that everyone can use to feel more empowered about not only noticing what’s wrong but also working to fix it. The S.H.I.F.T. Model™ was created to help individuals and businesses understand their obstacles and put systematic steps in place not just to overcome them, but to thrive and prosper. I urge the Occupy protestors to consider using this model to become more proactive and solution-oriented, and help our culture to shift to a position of problem-solving, not just problem noting. For those Occupy protestors willing to do so, there are five simple steps to take to put plans in place to work toward the change our nation needs in many areas. S – Specify the desired outcome. We know what we don’t want, but we often don’t take the time to clearly identify what we DO want. What does success look like? If Wall Street were to change, what would they be doing differently? What do the Occupy protestors really want? One of the knocks on the movement is that they don’t have any demands – clearly state what you want and what you are striving for! H – Highlight the obstacles and categorize. Yes, there are obstacles preventing many people from getting what they want and what they need. But complaining about them is like sitting at a green light and complaining how long it was red! Define what’s wrong – outline obstacles clearly, and then organize them by what you can control, what you can influence and what is out of your control. The Occupy movement could “influence” things with its sheer numbers – identify those obstacles you want to influence and put a focus on them. I – Identify the human factor. Who are the stakeholders in the Occupy movement? Whose attention do the protestors really want to get? Is it “anyone,” or are there individuals or groups of people who can actually do something to make a difference? Who do they need for allies? Who is working against them? Any effective change effort has to consider the people involved. Occupy doesn’t want a leader, but they still could benefit from identifying who is on their team, who they need on their team and how best to influence them. F – Find alternatives. This is the step that the Occupy movement is currently missing. What options do they have, and what could they choose to do? What matters most in solving the problem? What criteria for different change options do they want to apply? There are no solutions currently coming out of the Occupy movement – just complaints. We need to move to a culture of solving – not just pointing the finger at the problem or problem-maker. T – Take disciplined action. Create the plan. Outline the steps for moving in the right direction. Get stakeholders, find supporters, and determine what exactly needs to happen. The person or group that can create a clear vision for HOW to get a change in place will always demand the attention. If we can see what we need to do, and how to get there, we’ll more often move in the direction of the change than if we aren’t sure exactly what’s being asked of us. Occupy needs to create a vision for the change they want to see in the world, and then systematically move us toward that change. In summary, change is needed and it’s even better when it works for the betterment of the greater good. 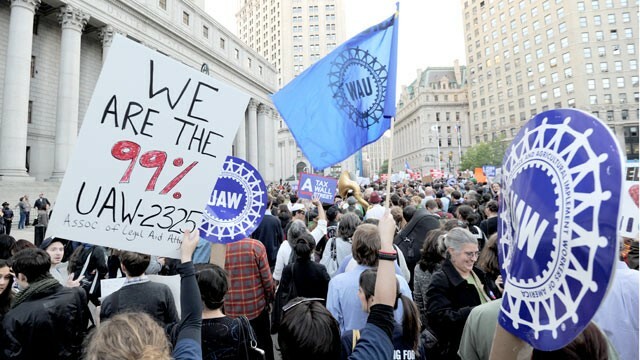 But change won’t happen if the Occupy movement simply wants to, well, occupy. They must organize, identify what they want, create the steps they need to get there, and use their collective strength and human factor to take the disciplined action that many people in our country today crave. 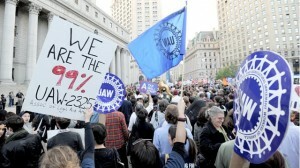 Let’s hope at some point soon the Occupy movement moves to the SHIFT movement, where real change can take place!